College cafeterias aren’t what they used to be—and I’m only five years out of university. 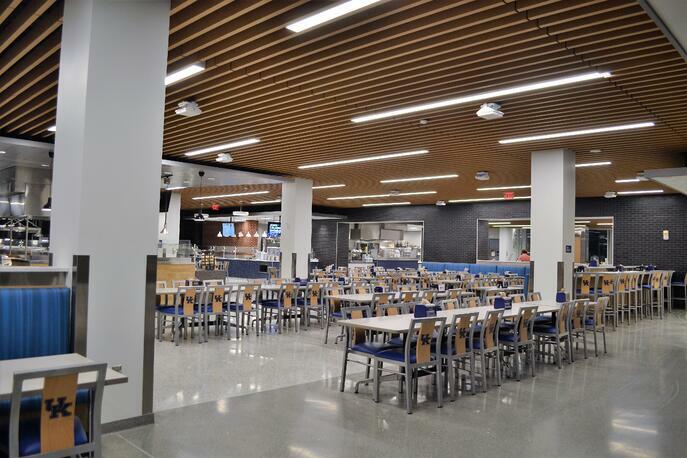 Within the last few years, gigantic multi-purpose (and well-designed) student centers and cafeterias have become the norm. 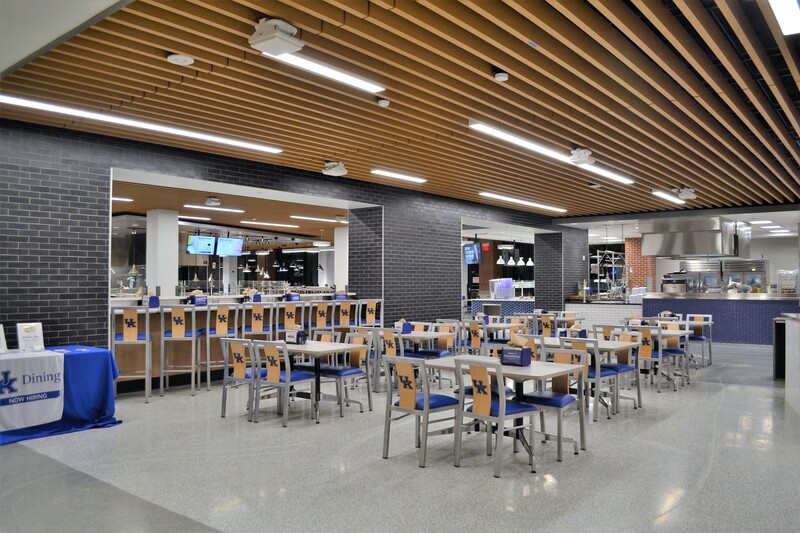 So long are the days of glum lighting, stale french fries, and bad furniture, these new cafeterias offer diverse cuisines and areas for multiple activities. Case in point: University of Kentucky Student Center. To my surprise, this part of campus had been grossly overlooked for the last several years. I learned that from Sarah Baker, the executive interior designer at KPC Architectural Products, a key player in the UK Student Center project. More importantly, Baker noted that this student center was meant to invigorate this part of campus as a center for student activity and daily life. 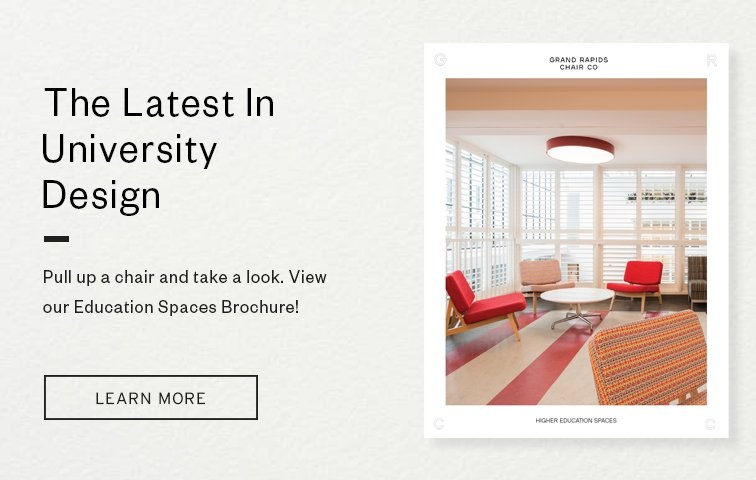 In order to accomplish this, the building’s design and concept required attractive amenities, loads of options, and a modern aesthetic—a place students would actually want to come to. 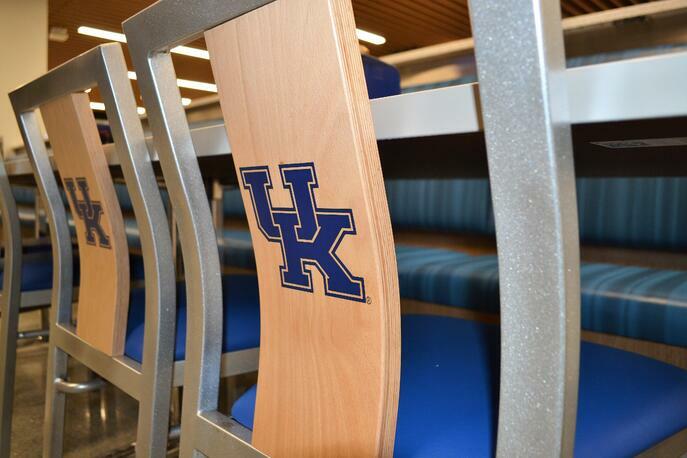 In total, the UK Student Center is a $175 million project that began in 2009. The concept was created by Perkins + Will while KPC Architectural Products, Inc., Tipton & Associates, Rosstarrant Architects, and many others executed design and specifications. The project’s scope was huge: an all-you-can-eat cafeteria, a movie theatre, a bowling alley, a fitness center, a retail center, a ballroom, outdoor lounge spaces, a media center, and more. You name it, the UK Student Center has it. 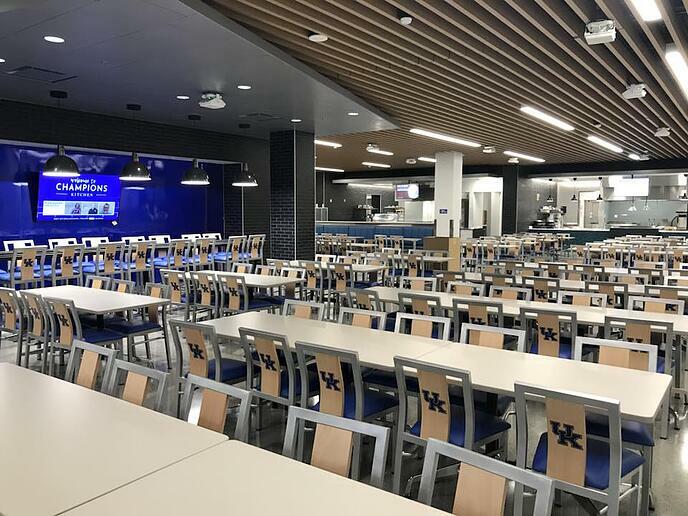 Speaking of cafeterias, the cafeteria inside the Student Center is aptly named Champions Kitchen, just recently opened to students and the public. This space goes all out on food and design. It follows the “more-is-more” concept that satisfies a wide range of audiences and tastes. There’s a pizza and Stromboli station, cold fruit and breakfast station, burger station, chicken fingers and fries station, taco and nacho station, salad bar, deli, bakery, and a worry-free zone complete with nut-free, shellfish-free, gluten-free options labeled with nutritional information. With the need to seat up to 600 people, it could be easy for this cafeteria design to go by the wayside, but not here. Once inside the Champions Kitchen, you’re welcomed with a sea of Wildcat pride. Nearly 400 modern steel chairs and barstools line rows of glossy white laminate communal tables and bars. The chairs and barstools feature a custom engraving of the university’s logo coupled with a lovely blue leather upholstered seat. Glossy, dark blue subway tiles adorn station fronts while red brick and polished cement floors create a modern industrial aesthetic. It’s bright, open, and the perfect space to accommodate solo or group dining, casual meetings, socializing, and even study sessions. And this is only the beginning of the design. The rest of the Student Center—bowling alley, theatre, media center, etc.—is slated to open in April 2018. 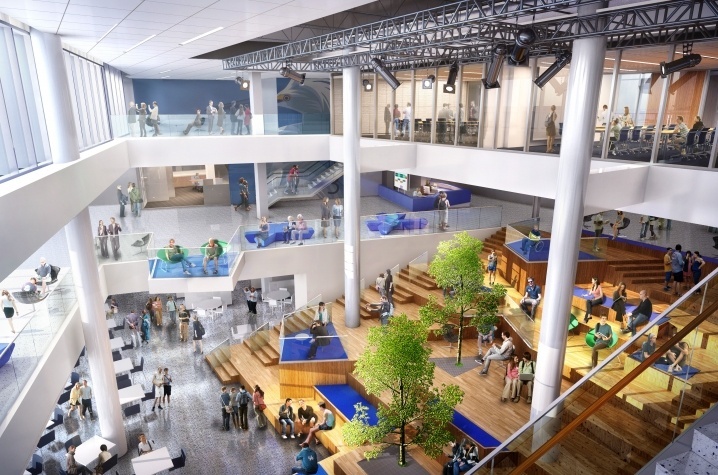 And if it’s anything like the colossal, student-friendly cafeteria, it will be epic. It might be sheer jealousy, but my student center never looked like this.